Here’s an interview with Jurdan Mendiguchia; a Spanish physical therapist who works with elite athletes (mostly soccer/futbol players). What I highly admire about Jurdan is that he’s not a research professor so he doesn’t have research assistants, expensive lab equipment, or funding, but what he does have is incredible passion and curiosity for sports science. How many physical therapists out there have published 28 peer-reviewed papers on their own time and dime? Not many! At the bottom of this blogpost, you’ll find links to all of his previous studies. I first interviewed Jurdan on my blog in 2010 HERE, then again in 2011 HERE. Jurdan recently published a hamstring strain rehabilitation study in MSSE that is receiving a lot of attention on social media. Below is a screenshot of the abstract. 1. Wow Jurdan, what a study! Please tell me how, when, and why you came up with the original rationale behind this protocol? It is a long story with several events that end up leading to this algorithm concept… But the most important arises about 10 years ago with a professional first division player who came to visit me after having suffered more than 14 hamstring injuries (summing both legs) and not having been able to play more than 5 matches per season in 3 years. It was an extreme case because despite having a contract the player wanted to end his football career. 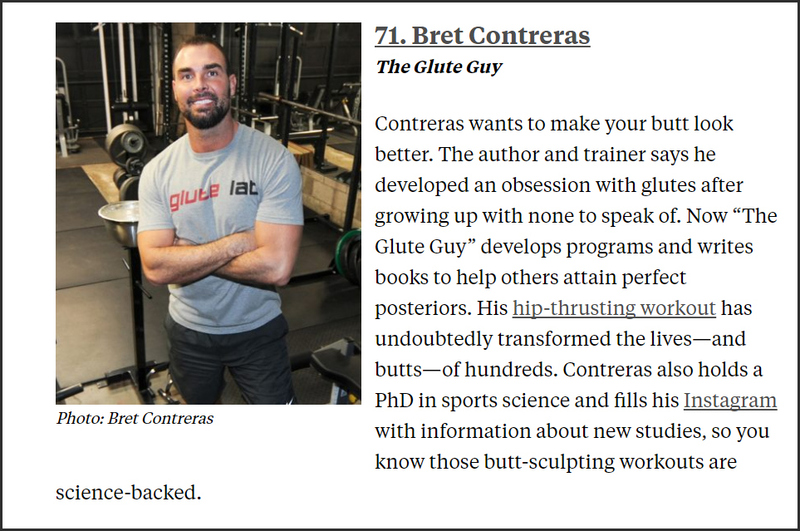 The fact is that after examining him, I was surprised to see that the strength of his hamstrings was huge and that contradicted in part what the literature commented about hamstring injury relation /probability related to a lack of eccentric strength. This, coupled with the fact that the player had strenuously trained eccentrically his knee flexors, made me think that I had to do something else as a physiotherapist. So, I decided to re-examine the player in detail and started training him considering those factors that I thought were related with his injury (and that were altered in this player) and from the interaction of the different body segments that acted on sprint mechanics. With all this I designed a specific program for the player (only once every 2 weeks 2 specific eccentric exercises 2×3 reps). The player did not get injured again, renewed his contract and played almost every game during the following 4 seasons. The same thing I have seen afterwards in several complex cases I was consulted for. All this led me to start thinking about the idea of ​​INDIVIDUALIZATION and customization for the treatment of the hamstring injury and that perhaps while most of the players (as the general evidence pointed) needed to work on strength-related factors (mainly eccentrics) others did not and had to focus on other factors. 2. Why an algorithm and not a protocol. What is the difference? Such a structure had the necessary flexibility that allowed me to express my concern at that time in relation to the multifactorial origin of the pathology and the need to customize it to each patient. While a fixed and rigid protocol did not allow me to assess the different factors and forced me to work without references, and assume that with that I would solve all the problems of the patient. I didn’t want to rehab machines I wanted to treat individual persons. An algorithm is nothing more than a systematic process consisting of a sequence of steps, each step depending on the outcome of the previous one in order to solve a complex problem such as a hamstring tear or make decisions related to RTP. The only thing we did was to configure the different steps according to the different risk factors, tissue repair biology and a detailed analysis of injury mechanism…. But be careful!! This is an open and flexible structure that must adapt and incorporate future research findings of course. We tried to create a process that is adaptable over time. I think this type of concept fits better and is exportable to the treatment of most sports injuries not only hamstrings. 3. 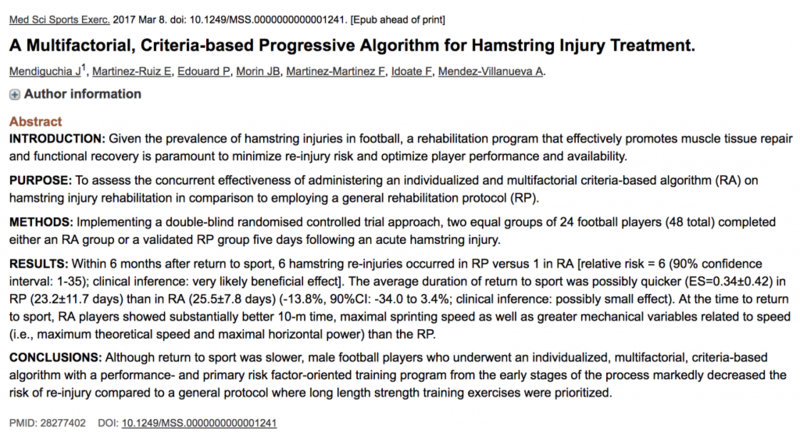 So, this experiment essentially tested the theory proposed in your previously published article (HERE is a link to the full PDF: Hamstring Strain Injuries – Are We Headed in the Right Direction)? As I said before, the structure and concept has been preserved since its first publication in 2010 but has already evolved. Science changes thanks to the great work of our peers and the algorithm therefore also changes. New criteria have been incorporated according to the new investigations of colleagues and to our work in the last years with special emphasis on the analysis of sprint mechanics, having the pleasure of working with JB Morin and collaborators, authentic trailblazers in this area of ​​knowledge. For us it is very important to correct the altered factors but also at the same time that the player develops their performance. That is very well reflected in our favourite sentence in relation to the rehabilitation of the hamstring: “Prepare and repair”. In summary, we could say that this work is a compendium of all the experiences and learning of my last years in relation to hamstrings and the complex task of understanding sprint in depth. 4. You have talked about criteria but what principles have you followed for the design of the content, its progression and periodization …? Basically, what we have done is a detailed analysis of each factor and its specific role in the different injury mechanisms and also in each phase of each injury mechanism where they can have different functions. From there the progression and design for each factor has been designed based on own and individual principles. Ex: knowing that the abdominal oblique musculature works concentrically during normal gait but eccentrically during sprinting, we have designed tasks and progressions accordingly… For the glutei, different tasks have been designed according to the torque -angle relationship of each exercise in order to cover all their roles during sprinting (I had a good teacher called Contreras on this) and for example in the design of how hamstrings work we rely on our work about activation / damage of different exercise published a few years ago with MRI (2012) in order to stimulate different muscles and portions and we progress through increased muscle length. Anyway, sure there are many more exercises, more beautiful ones, so this is just an example. Another novelty lies in the periodization and design of the content. For example, based on our clinical experience and muscular physiology, we decided to incorporate both very early eccentric exercises (as tolerated by the patient, with mild discomfort allowed) and running (mild discomfort and more vertically oriented in case of PAIN). However, during the last phase (functional phase) we did not allow to match during the same workout strength training with sprints and that´s why we propose a periodization by blocks of 3 days consisting of Day 1: sprint oriented tasks Day 2: strength and plyometric oriented tasks Day 3: mobility, lumbopelvic control and manual therapy. Also note that for the first time and I think it was necessary in the field of physiotherapy, we tried to take into account the design of volumes and intensities given the increasing importance and relationship that is being observed with regard to injuries. However, it is our approach and a first step opened to change because it is difficult to propose magic recipes. 5. Please summarize the findings of this study in layman’s terms so that coaches can understand it. It could be summarized as saying that an individualized intervention that works (to the intensity and marked volumes) and accounts for both the different risk factors of hamstring injury and sprint performance may be more effective in terms of re-injuries and performance, although moderately slower (2 days on average) than a standardized protocol that does not account for the evolution of the player and only focuses on 1 or 2 risk factors. 6. What does this study add and why is so important for practitioners? Given the poor prognostic value of MRI shown in the latest research I think that practitioners can use our algorithm as a reference framework and a guide if the injury is a grade 1 or 2, because they will introduce it in the work system which will in turn mark the gravity (costing more or less depending on criteria and phases) and will evolve in a safe way according to the injury and athlete characteristics in a specific and individual way, having a customized program for their athlete. 7. Moving forward, do you think that this approach can apply to prevention? I think so, that is its natural evolution since the origin of an injury can be explained by different causes and specific interactions to each person. In fact, this is what I do every day in consulting with soccer teams: Individualize prevention by analyzing each player’s particularities and those of the injury to prevent. The prevention feature will be difficult to test in research because of the tremendous work involved and the difficulty of its design but the door is open and it is clear that it is part of the future. In my opinion we have to move beyond the limitations inherent to the current reductionist model used to study hamstring injuries. We must understand better how for example the cause that one factor is altered, is provoked by another factor etc. Asymmetry after Hamstring Injury in English Premier League: Issue Resolved, Or Perhaps Not? This is so excellent! It’s great seeing a multifactored and individual approach like this. Definitely the future, looking forward to what’s to come.